This post is late (aren't they always? ;), but since I realized I still as of yet have not done a post about a drama camp that took up my entire week in April, I needed to get a move on it. So here 'tis! Academy of Arts is a week-long drama camp and we put on the drama at the end of the week. All of the high-school kids are arranged into different rooms (the girls have either Costume or Makeup) and I was in the Makeup. Last year (which also happened to be my first year) I was in the Costume room, so this was my first time being in Makeup, so that was rather interesting and fun. I had a lot of fun spending time with the other girls and learning how to do stage makeup. Check out my post from last year here. Well now, deep, I can't believe you didn't mention the greatest person in the play but what can I expect from you. The only thing that you are concerned about it your silly figs! Or you boyfriend, who really is the most pitiful soldier I have ever seen!! You two would be a perfect couple (of idiots). I was thinking the same thing! Why would someone leave out the most important character in the play? Without Atarah we would all die of thirst! How can you forget that!?!? I agree wholeheartedly with the second half of your comment(except that it's not figs, it's grapes, SEEDLESS GRAPES!). Abinidab takes after his father, who wasn't a good soldier but a wonderful sheep herder. Unfortunately we have yet to discover what Abinidab is wonderful at... That Screaming Person In Da Crowd, could you help with that? You are amazing at everything, surely you could find something for Abinidab to do that he could be amazing at. Thank you dear! To be honest with you there is not much hope for the brainless but good looking Abinidab, but with my skill I just might find something. I will have to search long and hard but I just might find something. But I have one question how is he your son? All of your other children are so accomplished at everything! Even the shepherd boy! I have full faith that you will find something that will bring meaning into his life. Thank you for your hard work and service! Honestly, he may have been adopted, but I'm not sure. Not all of them are as successful as David. Obviously not Abinidab, Eliab has some pride issues, and Shammah... he's just... Shammah... and the other four we don't speak of. Really David is the only one who never fails to make me proud! I don't believe we've met... and perhaps I'd rather not anyway. Please stop insulting Abinidab. It's not his fault that he's a dreamboat. And just as I admitted that Abinidab was a dreamboat, I will also admit that he is a slightly stupid dreamboat. Please, don't judge. Leah? Really?? He is like that one stupid soldier who is always getting yelled at because he can't do anything right. Who is to say that marriage will be any different? To be honest you don't owe Abigail anything, she just comes off as trouble. She is the whole reason I need a psychotherapist!! But I have to admit I have a really good psychotherapist!! Mother Nahash, I am working on finding something for Abinidab, it is hard, but I am working on it! But to do so I have to know at least a little about what he enjoys. Or what his favorite color is, it really helps my search. No, I know I don't owe Abigail anything; I meant she owes Atarah for all that water she imbibed in that one afternoon before Samuel came. Ah, yes; Mother Nahash is a wonderful psychotherapist! How would you know that Mother Nahash is a wonderful psychotherapist?!?! She isn't your psychotherapist!! Ok, girls break it up. You are singing my praises and I love that, but please don't bicker. Leah knows I am a great psychotherapist because she has witnessed my work. And Abigail does have some issues that I'm trying to help her though. What I do know is, he has an I(philistine)Watch, he hates seedless grapes, and I think his favorite color is prison orange( but don't quote me on that, I just made an educated guess). Notice that Abinadab only replied to Leah's comment about him being a "dreamboat but a slightly stupid one" and ignored all the other comments, even the one where I specifically asked him to reply to. This child obviously has a one track mind and is obsessed with what Leah thinks of him. Leah, only Abinadab can answer the grapes question, but he has been very up tight whenever my famous seedless grapes are mentioned, and he always has something rude to say about them. Therefore, he must not like them. That Screaming Person In The Crowd, I could adopt you, if you're agreed. I know a certain Mrs. Brewster who has a lot of experience in adopting childern,of all ages, into her family. If you would like to become part on Nahash's family I'll give her a call! I happen to appreciate prison orange. It brings out the color in my eyes. Although Abinidab is not exactly, how do I say it, conventional in his abilities, he still has Jehovah-given talents. Maybe his talent is to provide a listening ear for his loyal, yet sometimes blunt beau. Together, they would make the perfect pair, like seedless (ALWAYS seedless) grapes and figs. OK Informed Observer,I don't know who ya is but... Dat is kinda weird!! Prison orange?? Really?? By the way what color are your eyes?? I'm back! Finally read your post after a long day at work. You're welcome. I want to know what color prison orange excentuats. There is none. You probably just think that because you have been stuck wearing it for too long. And I think we are speaking of two different Abinadabs. My son is not the listening type, at least not as long as I have known him. Abinadab could be a phychotherapist, but I am the only one in all Israel so I would have to teach him, and he won't listen to me! If he won't listen to me, I don't see why he would listen to anyone else's problems. But maybe you are right, this might be his calling.. I have already contacted Mrs. Brewster and as soon as I can see you we will make you the newest addition to my family! Prison Orange excentuates a lot of colors! You are just not familiar with them because you are not privileged enough to get to wear it. Neither is your son, though, because he would love seedless grapes if he were introduced to the grapes they serve here, instead of your shriveled fruits! What is going on here? I seem to be in the wrong place. AND WHERE IS GEORGE?!?!? Mrs Darling, something is dreadfully wrong!! You haven't been born yet!!! But yet here you are! Informed Observer, you have no clue what you are talking about!! They have the most bountiful harvest of seedless grapes in all the land! The largest most beautiful grapes ever!! Also, what colors exactly does prison orange extenuate??? I want a list! Why would the lovely Mother Nahash wear prison orange?!? She has never done anything wrong in her life! I don't know about these uninformed people saying that they are informed, when they really have no clue what they are talking about! UNinformed Observer, you are obviously out of your mind, case in point, you believe that being forced to wear prison orange is a "privilege". I agree with That Screaming Person In Da Crowd, we have asked repeatedly which colors prison orange extenuates but you always avoid the question. Why you ask... Because there is no such color. And I resent the fact that you insinuated that prison food is comparable to my five star Seedless Grapes! There is absolutely no comparison. That Screaming Person In The Crowd, thank you for defending me! Leah is no help, and Atarah is to busy with Miriam and Abigail's thirst problem. You are already my favorite daughter, and it's not even official yet! I agree that something should be done about these uninformed people! We should come up with something to teach them a lesson. Mrs. Darling! You are still here? Something must have happened to disrupt the space-time continuem! (for those who didn't know, I am a time traveler on the weekends. I know, I'm just keep getting awesome-er and awesome-er!) We must find a way to get you back to the correct time period! P.S. I don't know who George is but, if he is anything like Abinadab, you should enjoy this time while he is gone! Prison orange accentuates (that was for you Leah) brown, grey, blue, and all other awesome colors. I was hindered in the ability to provide you with a proper list because I was feasting on the bountiful flesh of the amazing seedless grapes provided for me in my secure abode. Hi! I couldn't help but notice you were having time traveling problems? I would offer to help, but I didn't exactly inherit my dad's time abilities. I still feel dizzy when going way back! Just out of curiosity, did your problems have anything to do with troubled teens, a German professor, and a mashed balogna sandwich? No. I have no teens, German professor's, or "balogna" sandwiches. I'm not sure why we are having problems. (To be honest I think George pored his medicine into the machine to hide it from me. Uninformed Observer does it accentuate hazel by any chance? Mother Nahash, I am so glad I made you proud! I honestly don't think you could get any cooler!! You are like the greatest person in the world!!!! Atarah, You are the most hardworking person in the world, you have such a servants heart, it is just beautiful! Henrietta van Dorne, I have no clue who you are but where did you come from??? Is it a nice place?? Is it Orange or Blue? Perhaps if you described your method of time travel we (Henrietta and I) will have a better understanding of the situation. Even though she claims not to know as much about time traveling as her father she still knows more than the average person. Great to hear from you again! How is the family? Don't be embarrassed about the dizziness, if I remember correctly your father did say he always got motion sick whole time traveling with the professor. I don't see how anyone could get used to that crazy ride! You have apparently been blinded by the brightness of your orange uniform and can no longer discern differences between colors. Obviously You have never had my seedless grapes, because then you would realize the great insult you have cast apon me! But, because of your ignorance, I will ignore it. P.S. grapes don't have flesh, that would be gross. government schools that don't allow teachers to ever talk about God! It's really a cool place! Frankly, I don't care. I have enough on my plate with being a mom, running a vineyard, being a psychotherapist,time traveling, and I am in the process of adopting another child. Context and spelling are the least of my worries. Okay, it has been me pretending to be informed this whole time. I am really working on improving my relationship skills! It isn't going that well, as you can see! But I do think I deserve a bit of mercy, because I didn't know the facts to either of the romantic predicaments I have been involved with! It is great to get in touch with you too! Maybe we could chat on your time traveling weekends when you are back in time! Do you have a digital address? We are actually in the year 2038, but I see how you could get confused since you have been traveling so much! Prison orange does. Oops! That wasn't clear the first time. I'm afraid I don't know much about how we time travel. That has always been the work of a fine English gentleman who owns the telephone booth in wich we are riding. (He seemed hesitant at first but we are paying him handsomely) there is nothing I know of that is wrong in particular. You could ask him though. His foes by the name, "The doctor". I do know a little more about time travel then you do, but not too much more. I have no idea who this doctor is. He must not be in 2038. Bummer, he sounds so smart, yet reminiscent of creepy. If I were you, which I most definitely am not :), I would have hired Boggs, because he is a tad more experienced than this other guy sounds. But, like I said, I don't know much about this man. Does your telephone booth, whatever that is, have a bunch of colored luminous fusions? Oh! Wait! I think you call them light bulbs, or actually, lamps. All these time periods are more confusing than time zones! Ugh! I understand what you mean about the time period confusion. I have experienced it myself, throughout our jorney. We are from the 1800s but I don't know when the doctor is from. I believe that it is covered with lights. Although I wouldn't know what word to use to help you understand. I believe I heard my younger dad use that word. Then my older dad explained it was the same as luminous fusions. What about your kiddos? Did you have a mess up and forget them at home, or are they hanging with Peter? Sorry it has been so long, but I had to prune my grape vines and had a therapy session. This other "Time Traveler" sounds like a phoney. I wouldn't trust him if I were you. My sentiments exactly! Time travel is by no means easy peezy lemon squeezy! Nana, or faithful nurse, it taking exemplary care of them. We have the servants to do the house work, and cook prepares meals. Our household ran perfectly smoothly while George and I were on our last Holliday. I have every confidence in our staff. I am glad you can find good help in your time! The only help that is legal in 2038 is government provided. Ugh! That is why, when we were younger, my dad always tried to arrange to bring us with him. I am glad all the children are taken care of. Did this renegade time traveler take the time machine with him or do you still have it with you? Great question, girl! If the time machine is not MIA, it would be a lot easier for you to get back to whenever it is you come from. That us, if you don't feel like feasting on the seedless grapes that are not grown in Mexico that are available back then! If you are comparing my grapes to those cheap imitations I am offended, but you are correct in saying that mine are the best! You both are always welcome at my house in any time period! 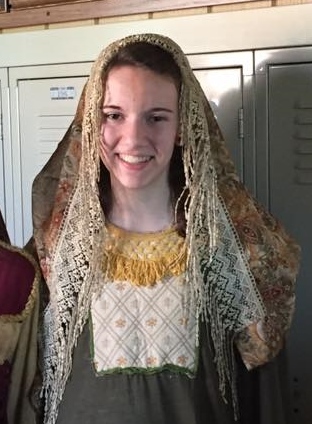 In the current time period just come to Bethlehem and ask where you can find the flocks of Jessie. They produce the finest wool in the hill country of Bethlehem so anyone can direct you there. Whether or not the time machine is still with you is a very important detail that I should have thought of sooner. Sorry! I was trying to mend the fences that were rent by my apparent inability to grasp the magnitude of the pride you harbor over your grapes and wool! It be lovely to visit your abode, but I am afraid that we are in the process of spring cleaning the way back. The grapes are seedless... 'nuff said. I assume you mean the GO BACK, but I understand your confusion. So many time machines it's hard to keep track. Oops! My bad! But hey! I should be cut a bit of slack, because it has been like almost three years since our adventure! Consider the slack yours! It's not a big deal since I know what you mean no matter what you call it. I am touched! I incidentally got time traveling means mixed up with the equipment of one Mr. Peabody. I don't know how I heard of Rocky and Bullwinkle when that was popular in the 1960s! From Madeline: In the words of Gavin and Elisabeth, your mom is something else! From Nahash: Samuel would make it super cool! Feel free to join in! You could come up with some awesome punch lines! Welcome to My Little Nook! If I ascend up into heaven, thou art there: if I make my bed in hell, behold, thou art there. If I take the wings of the morning, and dwell in the uttermost parts of the sea; Even there shall thy hand lead me, and thy right hand shall hold me.